After inheriting a Makonikey camp, a family rebuilds it for the next generation. “We were taking a walk after dinner and we decided to investigate what it would take to redo the house on the Vineyard,” said Paul Armstrong, Katherine’s husband, who quickly volunteered to oversee the project. The property has a great deal of sentimental value for the family and everyone treasured its simplicity. The challenge was to find a way to make it more practical for their grown children and future generations to enjoy without losing the rustic feel of the place that they all loved. Breese, for his part, was drawn to the natural beauty of the north shore setting and knew he could put together a proposal that would address all of the family members’ concerns. “It was all about doing something that was appropriate and respectful,” he said. The Ehrenkranz-Armstrongs agreed. “One of the requirements we had was that we wanted to keep a Vineyard look. We wanted to make the property understated, rather than overstated,” Paul said. 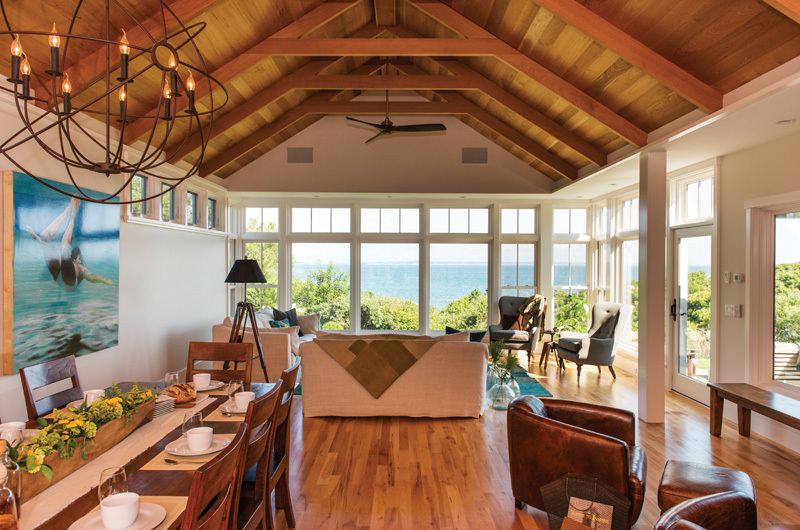 The great room’s vaulted ceilings and wooden beams were modeled after the original home. At first, the family hoped to build around some existing features of the original house, including a much-loved great room with vaulted ceilings and beautifully aged wooden beams. But Breese and his team felt it made more sense to tear down the house and rebuild what the family loved about the old room into the new home. In another nod to the camp’s storied past, the property’s second structure, a small studio space, was lifted, rotated, and redesigned as a sleek, detached master bedroom that now sits beside the main house. Breese brought builders Bob Stafford and Mark Ellis on board, and work began in October of 2012. “There were a couple of minor changes made, but for the most part everything flowed right from the initial schematic to final decorating,” Breese recalled. By Thanksgiving of the following year, the house was ready for its first family meal.